"Sampath Speaking" - the thoughts of an Insurer from Thiruvallikkeni: Maya, the Tiger cuddled by its child - set to become postal stamp ! Maya, the Tiger cuddled by its child - set to become postal stamp ! 29th July is - Global Tiger Day, often called International Tiger Day, a day invented to raise awareness for tiger conservation. All is not well with them. Last month Canberra's National Zoo and Aquarium's elderly Bengal tiger, Bakkar has died. It was not actually a death, the 21-year-old tiger was put down on Saturday due to ailing health, the zoo said. "As an elderly tiger he had begun to show a decline in his appearance in recent times and every possible measure was taken to maintain his health, comfort and well-being," the zoo said. "He remained mobile and alert right up to his last day but the decision was made to humanely euthanise him after his health declined rapidly overnight." Back home, Tadoba Andhari Tiger Reserve is a tiger reserve in Chandrapur district of Maharashtra state, notable for being a Tiger reserve ~ and this photo is making waves ! The tiger (Panthera tigris) is the largest cat species, most recognisable for their pattern of dark vertical stripes on reddish-orange fur with a lighter underside. Tigers are predators, territorial and generally solitary but social animals, often requiring large contiguous areas of habitat that support their prey requirements. Their areas have been shrinking. Tigers lost 93% of their natural habitat due to the expansion of cities and agriculture by humans. Fewer tigers can survive in small, scattered islands of habitat, which lead to a higher risk of inbreeding. These small islands of habitat also make tigers more vulnerable to poaching. One of the world’s largest tiger populations is found in the Sundarbans—a large mangrove forest area shared by India and Bangladesh on the northern coast of the Indian Ocean. Nagpur Today reports that – Amol Bais, a resident of Chandrapur, couldn't hide his enthusiasm as he recollected the first day of 2016 as if it was yesterday. 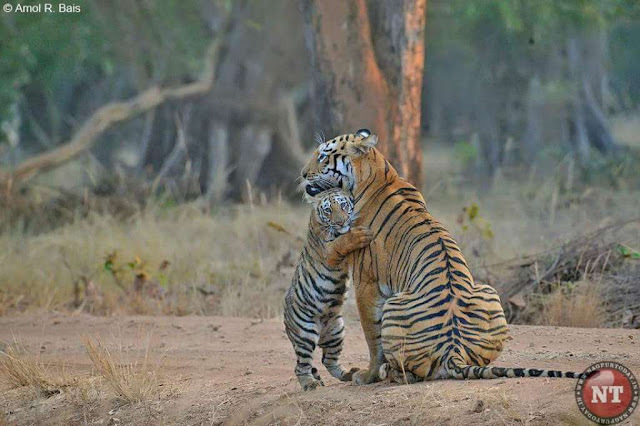 Seated in an open vehicle during the morning safari, he saw Maya, the tigress from Tadoba, getting a 'hug' from her cub, and even as he immortalised that moment, he had no clue that months later his iconic image would end up being used on a postal stamp. Bais, a wildlife photographer and headmaster of a school for tribal students at Durgapur on the periphery of Tadoba Andhari National Park, said his joy knew no bounds when he got to know that state forest minister Sudhir Mungantiwar was not only impressed with this adorable picture but has also selected it to be used for the stamp. Recalling the day, Bais said he was in the jungle for the morning safari, when at around 9 am he saw tigress Maya crouching for a kill, igniting the photographer in him with the hopes of capturing some action shots of beautiful Maya on the hunt. "Somehow the spotted deer in front of her were alerted and they took to their heels, leaving Maya with a dejected look. We too were disappointed and as we heard her growling faintly, her young one emerged from the bushes. I was then looking for a perfect angle, and to my surprise, I saw the cub standing on its hind paws and holding her mother with its front paws as if almost consoling her," said Bais adding that even as he captured the precious moment between the mother and her cubs even he could not help but get emotional. According to the 36-year-old, who has been photographing tigers and other wildlife for a decade now, his biggest moment for this image came when Save the Tiger – a facebook page on tiger conservation, posted this photograph and it ended up receiving more than 2.4 lakh likes and was shared by 24,000 people. "The image was also published by Daily Mirror, UK. And what gave me immense joy was that this image was presented by the forest minister to various dignitaries including Union environment minister and also for pamphlets of Tadoba national park," he said. "We had requested the Centre for a postage stamp on Tadoba-Andhari Tiger Reserve, which is one of the oldest in the country. We hope that this stamp will be released on July 29, on the occasion of the World Tiger's Day," said Mungantiwar adding that the beautiful image has a strong message on conservation and that he was happy to know afterwards that this photograph was taken by Bais who happens to be his neighbour in Chandrapur. So, the amazing picture of a tigress caressing her cub in Pandharpauni forests which has been viral in social media and seen global newspapers will have the honour of postal stamp too. news and photo credit : Nagpur today. Such a beautiful moment, a reflection of love between a parent and her child. This will surely be a postal stamp hit, even the people from custom writing in 24 hrs will buy their own postal stamp. best resort in tadoba for great safari like this i had very nice experience in tadoba. Will 'Brexit' lead to Scotout too.. ! !